Yesterday, on March 16, Kyiv's House of Teacher hosted an event, claiming the title of historical. 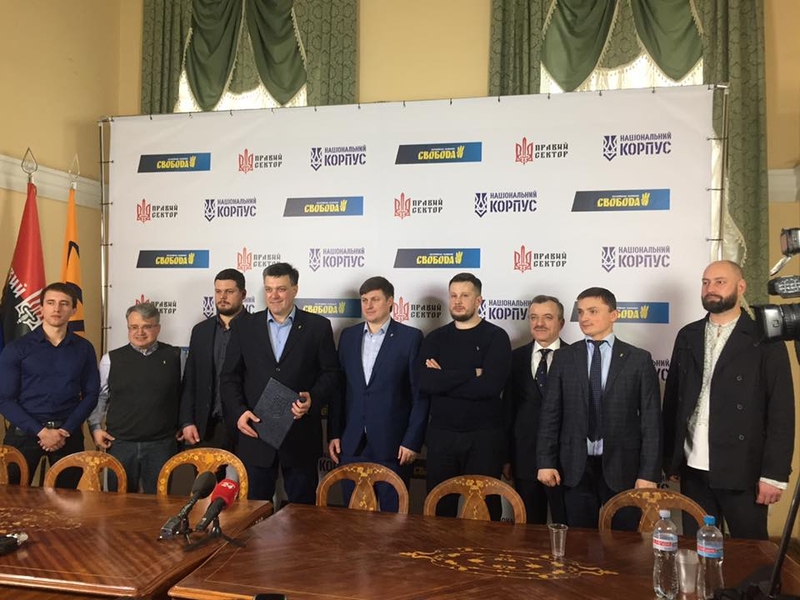 The leaders of Svoboda, National Corps and Right Sector, the biggest Ukrainian nationalist forces, have gathered together to sign the National Manifesto. In fact it is a joint program of tree nationalist movements. In the language of policy it means the transition form separate coordinated actions to an unity. Theoretically, from this point we can talk about the creation of an unified right political movement. The Manifesto text was solemnly proclaimed by Andriy Sereda, a front-man of the Komu Vnyz band, whose songs have long become hymns for generations of Ukrainian nationalists. As was noted, the event was full of historical symbolism. Not only because the meeting was opened by solemn performance of the anthem of Ukrainian nationalists, which had been traditional for the legendary OUN, but also because of the very event's venue. The Teachers House of Kyiv is a place wherefrom Ukrainian revolution had been started 100 years ago. The meeting was attended by leaders of other nationalist movements, in particular Bogdan Chervak (OUN), Stephen Bratsyun (the Congress of Ukrainian Nationalists) and Serhiy Mauzu of the C14. Of cource the nationalist leaders have also made speeches. In particular, Andriy Biletsky noted that: "this is the manifesto of the struggle with which we start our "crusade” against the authorities, the system, in the name of the Ukrainian Ukraine! Any document comes into real force only when people are ready to sacrifice own time, own happiness, and own lives for it. And we are going to fight until each provision will be implemented!" Andriy Tarasenko, the Right Sector political wing leader emphasized that: "this is the first time in the newest history when the vast majority of Ukrainian nationalist camp have united their efforts. And not around elections, but exactly arount the Idea and Deed!" In his turn the Svoboda's leader Oleg Tyagnibok said, that "history has shown that neither democrats, nor liberals, or socialists were able to realize the interests of Ukrainian nation. They are willing to make an agreement with anyone, but not to follow the will of the true owners of this land. Only the nationalists in power, will be able to run and develop the state in the interests of Ukrainians. Today is a historic day: we have gathered not to coordinate our actions, but to combine efforts for the Great Ukraine." - Social justice as a condition for ensuring the existence of the people and the power of the state. - The dominance of a unified state of the Orthodox Church.